Like many airports, Grand Junction Regional (GJT) performs its airfield repairs late at night and early in the morning to avoid disrupting flight operations. Naturally, this stretches projects across more days because crews work in shorter shifts. Last summer, however, the Colorado airport turned this standard paradigm on its head. 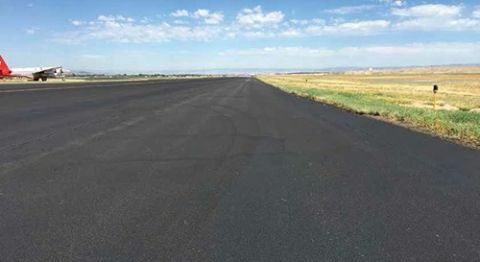 Using a quick-drying combination of liquid asphalt and special aggregate, crews repaired GJT's main 10,500-foot runway and major taxiways in 12 days. Total cost was $990,000. The airport's mix and volume of traffic guided its strategy. "We have strong demand for both commercial and general aviation," reports Jodi Doney, the airport's business relations specialist. "Last year, we enplaned 225,504 passengers-a 3% jump from 2015. We also have a significant general aviation community, with more than 18,000 operations last year. In addition, we are a frequent diversion destination for other Colorado airports that have weather challenges." Although GJT has crosswind options to accommodate its daily traffic, only the main runway is suitable for commercial aircraft. As such it opted to schedule main runway repairs between midnight and 6 a.m. when the airport closes. That meant it needed a contractor that could work quickly in short six-hour shifts, and a quick-drying (but long-lasting) asphalt. Airport officials turned to Armstrong Consultants for advice about both. And a few months after the airfield work was finished, they hired the firm's primary point of contact for the project, Eric Trinklein, to serve as GJT's own project manager and in-house engineer. "The airport's main runway was last overlaid in 2009, and a fair amount of rubber had accumulated, and the surface was oxidizing," Trinklein explains. "We knew we had to do the project in summer, when weather conditions would be optimal." The airport sent out a request for proposals in August 2015, and work began in June 2016, with Straight Stripe Painting of St. George, UT, as chief contractor. In between, Trinklein (then still employed by Armstrong) and GJT executives recommended a $990,000 budget to the airport authority, and secured necessary approvals from the Mesa County Board of Commissioners and the city of Grand Junction. The FAA and Colorado Department of Transportation also had to sign off on grants before crews went to work. "This was a challenging project that involved nighttime work, cool temperatures, short work windows and a large scope of work," says Bodin Breinholt, director of operations for Straight Stripe's Airfield Services Division. Crews performed a variety of services on the main runway and associated taxiways: rubber removal; pavement marking removal; friction testing; asphalt preservation; surface prep; material installation; and application of thermoplastic pavement markings. "There are multiple people and vendors involved in a project of this magnitude," notes Breinholt. Prior to any onsite work, Straight Stripe met with Trinklein, airport representatives and suppliers to review the specifications and discuss operations, limitations, project goals and expectations. Setting up a detailed production schedule required careful planning, Breinholt recalls. The month before construction was scheduled to begin, he and Jake Adams, the company's director of operations for pavement markings, strategized about how to maximize the six-hour work periods. "This was no easy task, as there were multiple crews," says Breinholt. "We had as many as 20 team members on site, performing multiple tasks each night. The work consisted of rubber removal, paint obliteration, material application, pavement markings and friction testing. Jake and his team did an excellent job replacing the markings on the surface every day prior to reopening the runway." Work began on the taxiways, using two of Straight Stripe's modified asphalt distributor trucks. Crews applied the new product and checked the results with a NAC Dynamic Friction Tester at predetermined intervals. After each friction test, Straight Stripe reviewed the results with representatives from the asphalt supplier and Armstrong Consultants. "The data was used to determine application rates as well as application cut-off times," Breinholt explains. Runway work followed quickly, and the entire project was completed in 12 days, with no accidents, incidents or delays. Asphalt Systems, the company that supplied the quick-drying materials for the project, was a key vendor during planning and construction. In addition to selling asphalt preservation products, company personnel consult about materials and technical matters for pavement projects throughout the world. "We had worked with the airport and Armstrong Consultants before, and they asked us about the most efficient way to apply asphalt at night, given this airport's climate and altitude," comments Brad Grose, the company's managing director of sales and marketing. "We suggested they use our GSB-78 product (a liquid asphalt)." Because GSB-78 is considered a "nonstandard" product by the FAA, the team had to secure special approval to use it at the airport. Grose explains that GSB-78 is very similar to the P-608 material often used at airports, with one key difference: It uses petroleum distillates rather than water to repair pavement. An important benefit of GSB-78-type products is their ability to cure quickly in cooler temperatures, which are common during the overnight shifts for runway projects. "As it is applied, GSB-78 penetrates into the pavement surface, chemically restoring the surface binder. It then seals the pavement from the elements," Grose explains. "As it cures, GSB-78 rebinds surface aggregate and prevents the pavement from drying out. This product, like the P-608 material, seals and enhances the natural oils and resins necessary for surface flexibility." GSB-78 can be applied with standard distributor trucks or hand sprayers. And because it is not temperature-sensitive, it has an almost indefinite storage life. "With regular applications, the surface life of a runway can be extended significantly," Grose continues. The product's short dry time makes it attractive to airports (like GJT) with only one main runway that needs to be ready for traffic at the crack of dawn. "The contractor can work more hours a night to apply the material, and in approximately two hours it will break and cure. It is very predictable and dependable," reports Grose. "We knew this product would work well in the cool evenings typical of Grand Junction in early summer." Asphalt Systems manufactured the material at its plant in Salt Lake City and shipped it to GJT in large-capacity transport trucks. It also provided the formula for how much aggregate to mix with the liquid asphalt. "We had one of our project support guys, Mitch Manning, on site to ensure that the proper rates of each were put down for evaluation by the engineering staff," Grose says. After Manning and personnel from Straight Stripe agreed on the proper application rates, crews loaded the aggregate into the hopper of a truck, which spread it on top of the liquid asphalt. 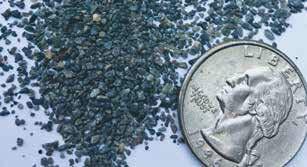 The aggregate for the project, supplied by Yawkey Minerals Management, was produced from a very hard form of rock found on the Mesabi Iron Range in northeastern Minnesota. "The iron mining operations crush it to certain specifications, allowing them to remove the iron content, and we upcycle a byproduct from the mining," explains John Vander Horn, manager of Yawkey's Processed Materials Division. "Our aggregate is dry, hard, sharp and angular, with a surface texture that enhances the bonding between liquid and aggregate." The company also makes aggregate for high-friction road and bridge overlays, and first worked with Asphalt Systems on a roadway project in Alaska. Grose asked Yawkey to develop a special gradation for runways, and the companies debuted the material at another airport in Colorado. The project at GJT subsequently used three truckloads of the special aggregate- 48 bags that weigh 3,000 pounds each. Yawkey's special aggregate mixture works very well with GSB-78, reports Vander Horn: "According to Asphalt Systems, the friction numbers and particle retention are better with this substance than anything they have used in the past. The bond between the aggregate and liquid is excellent. It works especially well in cooler temperatures." As such, there may be more airfield projects ahead for Yawkey and Asphalt Systems. "I know they are talking to other potential clients, and I think we team up with them very well," says Vander Horn. The duo's work at GJT seems to be standing the test of time. After nearly a year since the project was completed, airport officials remain very satisfied with the repaired runway and taxiway surfaces. "They have held up very well over the winter, and should be in good shape for several more years," Trinklein comments. "This project was very satisfying because everyone involved was very professional, it met the budget, and took fewer days to complete than we estimated."